The Cubs are World Series Champions. Yeah, I just wrote that sentence. Its too surreal. I’m not a Cubs fan, but its still surreal. To see how the team, the fans, and the city of Chicago reacted after the win couldn’t make you feel any happier for them. How could you not? It had been 108 years. No one in the country had ever seen this happen. Sports’ longest championship drought by far had finally been broken. It wasn’t easy. The Cubs didn’t have one thing they did throughout the whole series that helped them win. I mean, they were down 3-1 at one point! 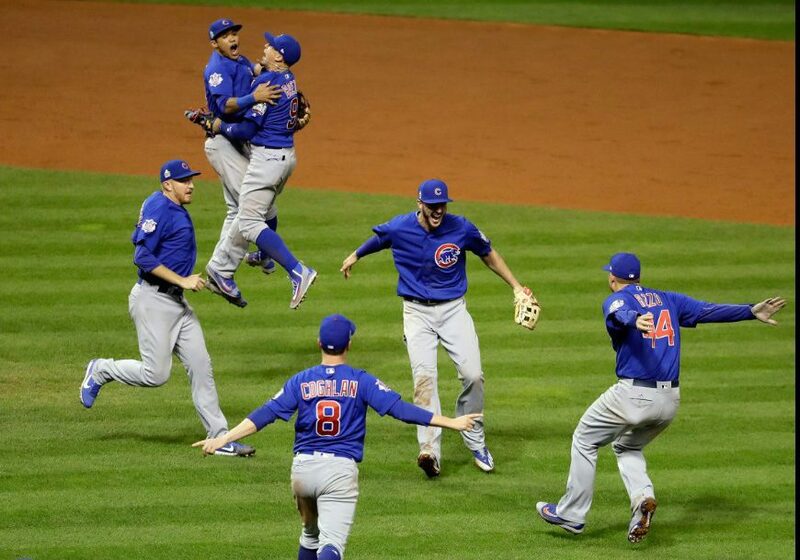 This World Series was truly won in Game 7. And that Game 7 was one we will never forget. The funniest part about Game 7 was that, the morning after, you found yourself talking about all the things the Cubs did wrong in the game. Yet they still won! It was a sloppy game overall. Basic defense wasn’t a thing. The Cubs were thankful Baez’s two errors didn’t result in runs for Cleveland. Cleveland had their defensive miscues too. They allowed Kyle Schwarber to steal a base. Rajai Davis was horrendous in the outfield (more on him later, though). This sloppiness, as I will explain later, leaves a stain on the legacy of this game. People criticized Joe Maddon for leaving Jon Lester out too long, but it really started with the decision to pull Kyle Hendricks in 5th inning. Hendricks got the guys on base, but didn’t let them score. If you leave Hendricks out there to clean up the mess he got himself into, the less you have worry about Jon Lester getting the yips and surrendering runs. Lester did get the yips, and allowed Cleveland to cut the lead to 5-3. It wasn’t too surprising from Lester. I tweeted before his outing that this was the Indians’ best shot to get runs, because the odds of scoring off of Aroldis Chapman weren’t too great, even though he did have a rough postseason and is susceptible to meltdowns, which may or may not have happened later on. Lester pitched well after that inning. The Cubs added to their lead, on Andrew Miller of all people. I’ll get to the Indians side of this game later. Lester found trouble again in the bottom of the eighth inning. He allowed two hits, leaving two on for Aroldis Chapman. Maddon didn’t want to take a risk, but giving what we know about Chapman, wouldn’t it have made more sense to leave Lester out there? Chapman hates coming in in the middle of an inning, and wasn’t great this postseason at preventing runs. We knew Chapman is meltdown material. Chapman first allowed a RBI double, but it got worse. Rajai Davis hit one of the greatest postseason home runs ever, yet it will never be remembered due to the game’s final score. The home run was the most MLB playoff-thing ever, and made Twitter lose it’s mind. Seriously, it was one of those moments where you see “Oh my God” being tweeted 17 times in a row. I counted for one of those. The most underrated part: It squared straight up with Fox’s camera. The best part was the camera guy scrambling to get out of the way before it squared up with his face. The 9th inning was just as tense as the rest of the game, but didn’t have too much drama. Chapman came back out, which was stunning and another one of Joe Maddon’s idiotic moves. If you watched the 9th, it was clear Chapman was out of gas. The fastball was low 90s, which is not great for Chapman, and the slider was ending up at the back foot of every batter, and guys weren’t swinging. It was rough. 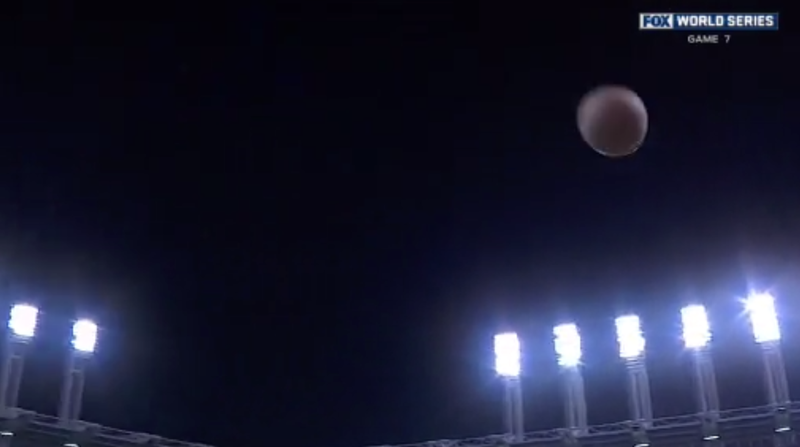 Anyways, Jason Kipnis hit a foul ball in the bottom of the 9th that I thought was gone for a second, but it stayed in the ballpark. Then the rain delay happened. Well, it kinda happened. It happened two years ago, but wasn’t discovered till the night of Game 7. The tweet was still wrong. We’re all still here. Anyways, the rain delay was the most dramatic and least dramatic thing that could have happened. Most dramatic because, well, what happened if the game didn’t end till like 3 AM CST instead of 12:30 AM CST? Talk about drama! It would have been eight hours of Game 7, the best thing in sports! But it was the least dramatic thing because it killed momentum, and killed the mood of everyone watching. Some people I knew went to bed. It killed the mood because the game was so exciting up until that point. Everyone was so disappointed in the decision. I got texts from like five different people that said “NO” or “WHY”. It was that kinda moment, but both teams kinda needed it. One used it to their advantage. There was a report that Aroldis Chapman was crying during the delay. First off, you’re a 28 year old professional athlete. You’re not the 2nd grade quarterback who had a bad game. Secondly, you beat a girl. You have no right to cry as a man if you do that. Anyways, Jason Heyward supposedly rallied the team during the 16 minute delay, which is weird because Jason Heyward should be the last guy to have the right to do that out of anyone on the team given the season he had. Thats something you’d expect from David Ross. The meeting worked. Bryan Shaw got rocked in the top of the 10th inning, mostly due to the fact that Ben Zobrist is built for the postseason, and that was it. Oh, and Anthony Rizzo freaked out. The Cubs were World Champions. So what went wrong for Cleveland? The simple answer is that they ran out of gas. Corey Kluber had one of the best World Series outings ever in Game 1, and had the Cubs stumped again in Game 4. Game 7 didn’t go his way. Not gonna lie, I had the Indians winning Game 7 because of Kluber being on the mound. But what I failed to consider was his workload. He had thrown 169 pitches over the course of nine days, and had to add to it on the ninth day. Its not that Corey Kluber isn’t a good postseason pitcher, or can’t handle the moment. Its simply that he got worn out, and when you consider how well he pitched for that long, you can’t blame him. He was worn out, and that trend continued for the Indians throughout the night. Andrew Miller is baseball’s best reliever, and even he struggled in Game 7. Again, it was the same problem: Wear. Miller was worn out too. He gave up the David Ross homer, which as soon as that happened, I knew some way, somehow Chicago was winning this game. It wasn’t only wear that plagued Cleveland. Coming into the postseason, we knew this bullpen was good. But I had doubts. It wasn’t the best in the playoffs, and was susceptible to issues. The bullpen was sound the whole series, and it turned out that it would have worked out better the other way around. The Indians’ bullpen had their worst moment of the series at the wrong time. Its as simple as that. This series, and in particular Game 7, was unbelievable. Its hard for me as a 16 year old to rank the best games of all-time, but I can make a list of games in my lifetime. Game 7 is pretty high on the list, but also understand that whats below is in no particular order. I’m probably forgetting some, but those are ones I can roll right off the top of my head. Honestly, Game 7 of the 2001 World Series probably gets the nod over this year, simply because my Diamondbacks won the whole thing on a walkoff in their fourth year of existence, and because this year’s Game 7 was super sloppy. And yes, I was only a year and a couple months when that game happened, but for those who ask, yes, I have watched the entire game before. No matter where it ranks, this World Series will be remembered forever.